1989 had its share of ups and downs. Seinfeld premiered, which turned out to be the funniest sitcom ever. Ayatollah Khomeini placed a 3 million dollar bounty on the head of Salman Rushdie, and then died later that year. During the funeral, his corpse fell out of the casket into the mob of mourners. Pete Rose was banned for life from baseball for betting on his own team. And the Sega Genesis was released. This marked quite an improvement on the original Nintendo Entertainment System (NES) but never had the quality or selection of games. 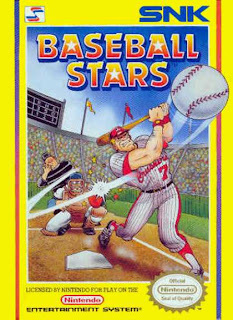 And in 1989, Baseball Stars was released for the NES. 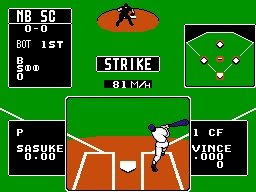 While many of you may faintly remember this game, its effects have been felt in the video game sports genre ever since. Let me rewind my life a little. As a young teenager who was cut by the high school baseball team, I had to devote my time and efforts elsewhere. Nintendo quickly filled that void. As my Mom would not allow one in our home, I quickly started spending every waking moment at a friends house getting introduced to Little Mac (Oh yeah I beat it), up up down down left right left right B A, and the "art" of getting a NES game to function normally. You see, roughly 70% of the time you started up a game, it would freeze, mess up the graphics/sound, or just blink. You would need to dry out your mouth, and then blow on the socket portion of the game for 5 seconds. You then inserted the game, and wiggled it back and forth at least 10 times before starting up the unit. As the NES got older, it became necessary to put another game in the open slot above the game to keep it from freezing up. Most weekday afternoons were spent firing up baseball stars, and throwing on some of my friend's vinyl records. I still don't know what the music is on the game, as we had "Yes" or "Cream" cranking while we played. It was one of the first NES games to have a the opportunity to SAVE YOUR GAME. Think of how ground-breaking this was!! Up to this point, when the power shut off, your game was over. In this game, you could save at many different points of the game. This enabled you to create a season, where all stats were kept throughout the year. In addition, you could create your own team and players. Every sports game today has this feature, and Baseball Stars pioneered this function. None of you would have your precious little "Miis" without this game. After creating a team, you'd play in a season, and get money for winning games. This money could be used to build up attributes for players on your team. Perhaps you wanted a power pitcher, or a speed demon leading off?? You made the call. Game play was better than any sports game up to this point also. When a pop fly was hit, the fielder would automatically start running to the spot where the ball would land. In addition, there was some "reality" in the game. If you tracked down a ball in the gap at a bad angle, the throw would be poor. Compare this to charging a grounder in center field, and usually a good throw would occur. In fact, this game was better than most baseball games that came out in the next 5 years, even though they all tried to mimic it. And the fact that you could climb up the outfield fence to steal a home run was classic. I became interested in fantasy baseball. I now play first-person shooter games against 13-year olds online. I never really had a steady girlfriend until I was 17. OK....maybe "those" people are right about video games. All this talk of Baseball Stars has me itching to lace 'em up against the American Dreams in a quick game!! Baseball stars hits it out of the park with a 4-star rating.